Aerie is body positive? In a body politics view, not quite. Body positive clothing? An improved version of Victoria's Secret? Supporting more diversity in body types? Yes, please! Wait — not like that, though. These statements entail my thoughts when I walked into Aerie, branded as aerie, for the first time. Yet another example of almost-but-not-quite body positivity, aka body positivity that still fits thin privilege standards. If you haven't heard, Aerie is a store owned by American Eagle Outfitters and sells lingerie, bathing suits, athleisure, and other similar items of clothing. One of its campaigns is #AerieREAL, in which it encourages people to post untouched photos of their bodies no matter what they look like. It sometimes will even donate a dollar to the National Eating Disorders Association for every post with that hashtag it sees. In addition, the Aerie store is filled with pictures of women who have bigger than stick-thin bodies. I chose the phrase "bigger than stick-thin" over "diverse" or "overweight" or "curvy" on purpose. While the bodies do have curves and are just as valid as the healthy body of someone who's thin or fat (reminder: fat is not a bad word, but a descriptor! ), it doesn't fully encompass as best it can bodies of people who are Fat with a capital F, who are not able-bodied, who are very dark or very light, who are transgender, who are not conventionally attractive, who are really old or who have skin diseases. Body positivity, at its best, is body politics. It's not only weight or shape, but it's also every other aspect of a body that exists and can be an object of privilege or oppression. When I was in the store, I desperately looked to find a body that looked different than that of any other. I loved Aerie's campaign and really wanted to find a store that was embracing what stores should be embracing all along. The video they created and the pictures of women on their website could be worse, I admit. Aerie is making progress that no other store has. Additionally, I just heard that their fitting rooms have sticky notes where people can write encouraging messages and that the bottom of the mirror says "This is what #aerieREAL looks like." But walking into the store this past summer for the first time, for my first experience in Aerie when I had heard so many good reviews — well, I was not satisfied. Thin privilege was everywhere. If you haven't heard, people who have thin privilege usually fall into these categories: can find their size easily in every store, aren't told to lose weight, easily fit into one airplane seat, aren't denied jobs because of discrimination against their size or the stereotypes that go along with them, and can eat "junk" food without others' judgement. I'm happy to say that these women portrayed were mostly "regular people" rather than solely celebrities or other kinds of famous people. However, I did see one strong woman I recognized: Aly Raisman. Raisman's advocacy for survivors, her teammates, and herself is something I look up to and greatly respect. She is the epitome of a strong woman and role model. I'm glad that she and the media have spread her message in court and on Twitter. However, I hurt for her other teammates, fellow survivors of Larry Nassar's abuse, that have power in other ways that didn't show as prominently during their testimonies and messages to Nassar. Those women are just as strong and important and admirable. If they want it, they deserve a little spotlight and appreciation too. My message to Aerie is this: keep doing what you're doing, but also do a little bit more. Strive for high levels of diversity. Change society's narrative on "attractive" and "worthy" and "admirable" and "beautiful." Use your power to spread unpopular but true opinions and advocate for those marginalized individuals and the rights they deserve. Don't play it safe; make a big statement. Be loud and proud about what you believe (or should believe, in my opinion) that's controversial. Include women who are transgender. Include women who are Fat. When you say #AerieREAL, mean it and show it. We don't want almost-real, or kinda-real, or real enough. We want REAL, and every, and firm. My whole life I've been thin — which is kind of an understatement. Every time I go to the doctor I get the same “you're underweight" lecture that I've heard every year since I was able to form memories. I've never really felt insecure about my weight, I love being able to eat everything and not gain a single pound. Since my freshman year of high school, I've probably only gained 8 pounds and I'm now a sophomore in college. Of course, in school, there were rumors that I was anorexic or bulimic, but everyone who knew me knew that was far from the truth. I'm now 19, 5'2, and I still have yet to break 100 pounds on the scale. 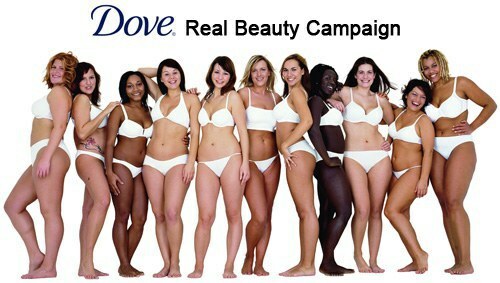 It seems that there is a lot of skinny shaming going around and to me, one of the main contributors to that is the Dove Real Beauty campaign. You're probably wondering where I'm going with this because skinny girls get all the praise and other body types are neglected. That's really not true, though. 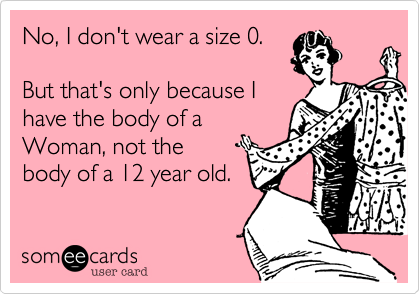 While loving other body types, you are tearing down skinny girls. Why is it OK to do that to skinny girls but not to other body types? Why is it OK to say “only dogs like bones" or say “every body type is beautiful" until you see a model's abs, or ribs, or thigh gap and then tear them down because they're “unnaturally" skinny? The point I'm trying to make is that, as a naturally skinny girl, I have never shamed anyone for their body type, yet I go every day and get at least two comments about my weight. I'm always the skinny girl, the toothpick, but I'm not Jessica. Yeah, I'm a size 00. Get over it. If you have an issue with my body and feel like my body is disgusting to you, don't look at it. I know that I'm healthy and I don't need your input when my body just naturally burns calories fast. I don't have an eating disorder and never have. I am real beauty though, and I know that because I'm comfortable in my own skin. So, maybe the real issue is that we as a society have been shoving certain body types down our daughters' throats so they begin to romanticize models that have certain standards that they have to meet, who work hard for the bodies that they have, and are making a hell of a lot more money than most of the people discussing why they look emaciated while what they're actually looking at is the photoshopped product. I'm not going to apologize for being skinny when that is just how my body is, I can't help it.